What better way to start off a head coaching career at Tech than with a helicopter ride? On Tuesday, January 22, Geoff Collins took to the skies in his personal chopper to visit four Georgia high schools and begin the recruiting season in earnest. While the helicopter is practical in a sense — making trips across the state easier and faster for Tech’s coaching staff — it serves a far greater purpose. 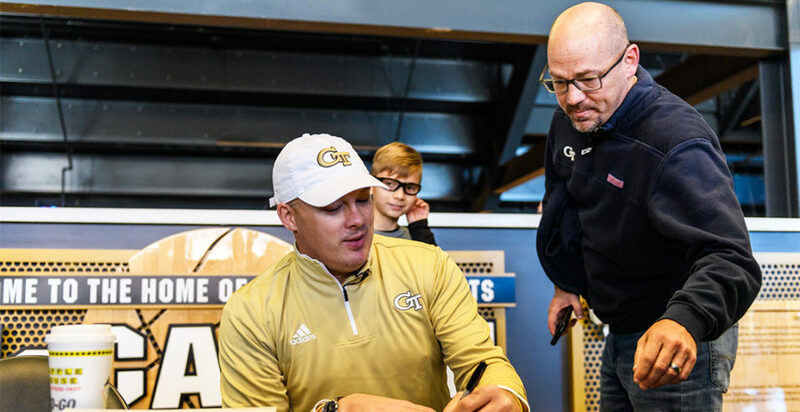 With Collins’ plan to completely revamp the Jackets’ offense to a pro-style scheme, recruiting top talent to implement his offensive vision will be especially important this offseason. Collins’ strategy to recruit these players, however, is unprecedented in Tech’s history; in his heavily Tech-decorated helicopter, Twitter handle emblazoned on the side in bright yellow, Collins was letting the world know that Tech football means business and impressing potential recruits along the way. Using helicopter rides in recruiting efforts, while new to Tech, is not unheard of nationally. In fact, Geoff Collins made headlines in 2017 for using one in Temple’s recruiting efforts; maybe flying in helicopters is just his preferred means of travel. He is in good company, though, as other top football recruiters in the country, such as Nick Saban, are known to use choppers as well. It makes sense that many football coaches use the grandiose gesture to impress high schoolers and demonstrate the wealth of their schools’ football programs. Tech has not necessarily been regarded as a football school to the extent of a school like Alabama in the minds of high school talent, but Coach Collins is working to change that. Yes, flying a helicopter to local high schools caught the eye of many students and created some buzz around the Jackets football program. The purpose of the trip, however, was not to speak with individual players at these schools; rather, as a new head coach in Georgia, Collins used the trip as a means to begin building relationships with coaching staffs of the state’s top high school football teams. His trip appeared to be successful at achieving that end. Coach Tanner Glisson from Troup County High School said after Collins’ visit, “Georgia Tech is serious about recruiting. That was the statement,” courtesy of AJC.com. Maintaining healthy relationships with high school coaches is imperative in bringing in talent not just this year, but for years to come. The steps Collins takes now lay the foundation of future recruiting efforts as the team roster transitions toward his envisioned scheme. Collins has expressed his commitment to bringing local talent to Tech. As one of the country’s most prolific producers of elite talent, Georgia is a target location in recruiting efforts for top schools nationwide. Yet, in the past four years of recruiting, only one top 50 Georgia recruit has committed to the Jackets per year. That a power conference school with a relatively good tradition of success to find recruiting so difficult in its backyard is both a cause and symptom of the team’s recent problems on the field. It only makes sense that Tech should aim to further tap into the pool of homegrown players that could make the football program great. Collins will continue to make these trips, whether by helicopter or something less flashy, as the offseason continues to shore up the 2019 recruiting class and make strides toward becoming a legitimate contender in the ACC and perhaps beyond.